We did it with Pepsi Refresh, now a new Community-funding grant program has opened up and a Windsor-Essex organization is ready for you to vote for them. 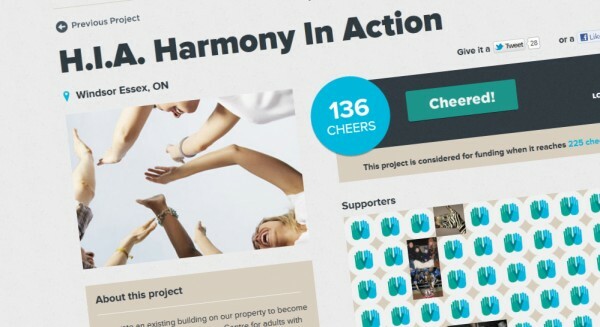 Harmony In Action has been chosen by Molson Coors’ Community Cheer program to participate in their annual cheer program — the only agency in Southwestern Ontario to be chosen! HIA’s proposal is to renovate the small building on their property to turn it into a recreational centre for the disabled in Windsor and Essex County. In order to be considered, they need a minimum of 250 votes! The project is worth $200,000 and will benefit all of Windsor and Essex County. You can register and vote here. Voting lasts until February 17th. Click the above link and find the project. Click “insider login/signup” on the page of the project you’re interested in – Molson Insider is our program that ensures participants are Canadian residents and legal drinking age. If you are not a Molson Insider, register below by completing the full form to (takes about 1 min) You can also use facebook connect button to help you register through your facebook account.